PLEASE use the download URL's provided on this site to stay current and up-to-date. There are many reports of modified files out there. Using the URL's here will keep you safe. Enjoy HD audio and HDR / UHD video playback, the easy way. Watch Ultra High Definition 3D video without needing expensive players. Listen to TrueHD Atmos and DTSx MASTER audio using HDMI to an AVR. Standalone, pure 64Bit Codec installers are available, Here! The ADVANCED release contains a full suite of decoders with a GUI controller for the installed codecs. The STANDARD codec release only contains LAV filters and VSFilter with a GUI giving full control. The following filetypes are enabled and SUPPORTED by the installation of Shark007 Codecs. To directly contact the developer, Shark007, click the donation button to reveal an email address. You can also choose to use the Forums to seek assistance on an individual basis or leave comment. All pages contain download links for each product. When dealing with codecs, more does not equal better. Having the least amount on your system is the best configuration. This is exactly what these codec releases will do for you. You will no longer be restricted to using any specific player. 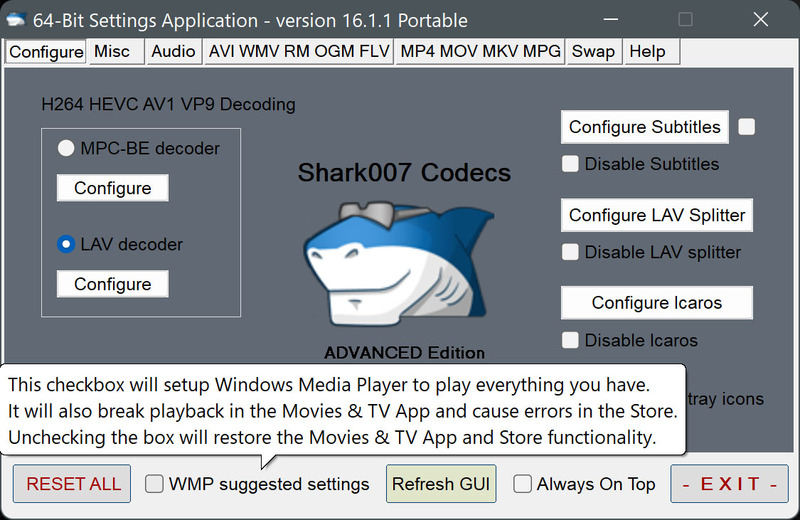 WMP and your Windows Media Center setup will play all your files. The ADVANCED release contains a full suite of decoders to choose from. Upgrade installations are fully functional! The STANDARD release only contains LAV filters and VSFilter for subtitles. These installers fully support HDR and 3D playback - out of the box! Thanks to everyone who has made a donation.